Can plants grow without soil? It's a question many people ask, especially those who don't have yards and might not want the mess of container gardening with soil in their apartments or homes. The simple answer is yes, and there are actually two different ways: hydroponics and aeroponics. The first way the question, can plants grow without soil, was answered was through the science known as hydroponics, or growing plants in water instead of in soil. All of the nutrients that a plant needs are provided through the water, so the plants are just as healthy as they would be if they were grown in soil, but you don't have the mess, expense or weight of soil in your hydroponic garden. The idea is that more food (or other plants, for that matter) can be grown in a smaller space, even places where the soil is not good for supporting life, as well as in places with no soil at all such as rooftops and classrooms. Paying attention to the plants and the nutrients they are receiving is very important when growing plants without soil in this way, because both a lack of nutrients and too much of certain kinds of nutrients can negatively affect how the plants grow. You also need to make sure that the water level in your hydroponic garden stays consistent, since it is the water itself that is keeping the plants alive. 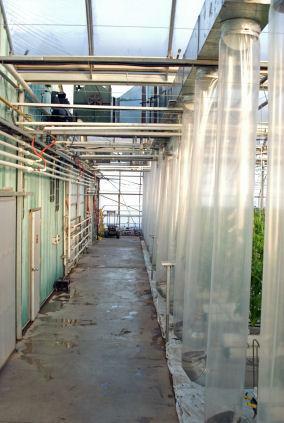 A similar technology to hydroponics has been developed that uses nutrient gel packs to grow plants, as seen at Seedman.com. These days there is another answer to the can plants grow without soil question: aeroponic gardening. This is the method used by the now-famous Aero Garden, where both the air and water surrounding the plant provide it with the necessary nourishment. These self-contained gardens make it possible to grow herbs, flowers and produce year-round, indoors, without soil. The Aero Garden also has a computerized mechanism that tells you when to add water and nutrients, so it takes a lot of the guesswork out of traditional hydroponics gardening and seems to make it easy for just about anyone to grow plants quickly and achieve good yields. You might also have seen aeroponics at work in Future World at Walt Disney World. The exhibit includes an aeroponic garden that produces more than 20,000 pounds of food used in the Disney restaurants each year, all without soil. How Can Plants Grow Without Soil? If plants are getting the right nutrients from the soil and air around them, it is quite easy to successfully grow plants without soil. Why would you choose to grow plants in this way if you have soil or a yard handy? Studies show that more produce can be grown in a smaller space using hydroponic or aeroponic methods. For example at Disney, about 250 tons of tomatoes can be grown per acre in the aeroponic garden, compared to about 10 tons per acre in conventional gardens in the ground. Plants grown without soil also tend to grow faster than plants in the ground or in containers. From an environmental point of view, these methods of gardening are ideal because they use less water than planting in the ground, as well as no soil. The plants can be grown organically very easily because they aren't assaulted by the pests in the soil and can even be grown indoors, away from insects and other pests. Disney might not have been that far off when they said that aeroponics would be part of the Future World. As we struggle to find ways to feed an ever-growing population with less land available for farming and in a way that produces a limited environmental impact, its likely more people will be looking at ways to grow plants without soil, not only for large-scale farming operations, but also as a way to extend the growing season by brining plants indoors during the winter months.